Southwest of the Salt Lake City Airport, the Church of Jesus Christ of Latter-day Saints operates a massive humanitarian center stocking and disbursing food and relief supplies to any place in the world where these are needed. The work done there is symbolized by a large sculpture in the glassed lobby, a figure of the Good Samaritan administering to a destitute man dying of thirst. The statue is by sculptor Stan Watts. Reflecting Stan's optimistic and spiritual nature, the statue is entitled Go Thou and Do Likewise. The well-clothed, kneeling Samaritan bends over a scantily clothed, emaciated man who is clearly distressed and gives him water. Symbolically, the sculpture represents the two poles of humanity. The poor man represents the impoverished and needy of the world — whether that impoverishment is one of physical food and water or the more abstract qualities of life. The impoverished man, perishing of thirst and too weak to draw water from the well, has been ignored by all the passing travelers, until a Samaritan stops to help. Although the bearded and turbaned Samaritan wears the long robes of a relatively prosperous Middle East individual, he has not been given clothing or markings that would identify him with any particular group, even though the parable refers to him as a Samaritan. He represents all of us — collectively and individually — who have and our need to administer to the have-nots. In creating Go Thou and Do Likewise, Watts was determined to make the figures universal — not tied to any nationality or ethnicity. The two figures are beautifully modeled. They rest on a rough desert terrain that is slightly slanted so that the upper body of the impoverished man is inclined. Even so, the Samaritan supports the head of the poor man so that he can drink more easily. Watts has the singular power of breathing emotion into his depictions, despite the hardness of bronze. Of his many sculptures, this is the one that Watts would most like to see carved in in Italy in stunning Carrara marble. This is a costly procedure that does not seem appropriate for use in a center where resources are conserved for the aid of people in distress. For the marble rendering, Watts must wait for a benefactor or a business that wants to share the marble beauty of Go Thou and Do Likewise in another location. Watts is best known for his towering (20 foot) figures of three firemen raising the American flag in the rubble of 9/11; his depictions of Lincoln, and his equestrian figures of Joseph and Hyrum Smith riding back to Nauvoo and their certain martyrdom. Go Thou and Do Likewise has brought together Watts and David A. Christensen. Christensen retired after 22 years on the religion faculty at Brigham Young University-Idaho. As a young missionary he served in Mexico City. As an adult he served as a mission president in Chile and as president of the Missionary Training Center in Guatemala City. Christensen is the author of Questions of the Soul, Answers from the Book of Mormon; Inner Victory; and Power in Prayer, scheduled for April release. Inner Victory, "winning strategies for managing life's transitions," has been used in seminars, college courses, and state correctional institutions. Christensen is CEO of One Life at a Time, a philanthropy that is the epitome of the Good Samaritan principle. One of its objectives is "to help young people of Central America overcome poverty by providing education, teaching of technical skills, and identifying better employment opportunities." To help One Life at a Time raise contributions, Watts is producing a very limited, table-top edition of Go Thou and Do Likewise. 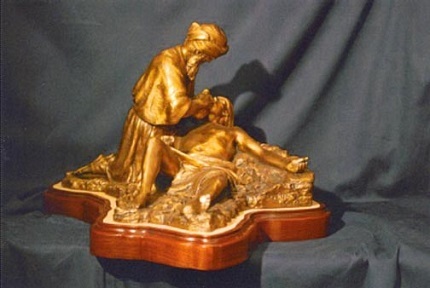 Go Thou and Do Likewise is a bronze sculpture 21" wide x 20" deep x 13" high (including 2" base). The bronze has a unique gold patina that transforms the depiction. A conventional bronze patina would be enough to confirm the power of Watts’s sculpture. But the rare gold surface draws the eye with such force that a viewer cannot look away. As a work of art, The Good Samaritan is extraordinarily beautiful. The statue sits on a carefully selected and finished non-rectangular marble and wood base. The stone is a layer of Jerusalem Gold Marble from the Holy Land, specifically selected by the artist. That thin slice of marble is a touch of genius. Together, the glistening gold bronze and base are simply stunning. 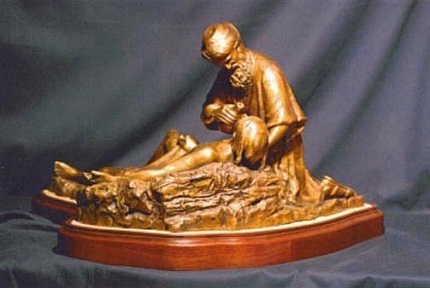 The sculpture dramatizes Jesus Christ's New Testament Parable of the Good Samaritan. As I have said — and wish to repeat — Watts uses the parable to create a depiction that goes beyond the confines of any religion and poignantly dramatizes the human necessity for compassion. Stan Watts approaches every work of art he creates with a deep spirituality. This is true even when he is engaged in a secular subject, like a soldier or a patriot. He is incapable of trivializing anything he creates in clay or bronze. There is always a deep soul in anything he touches.